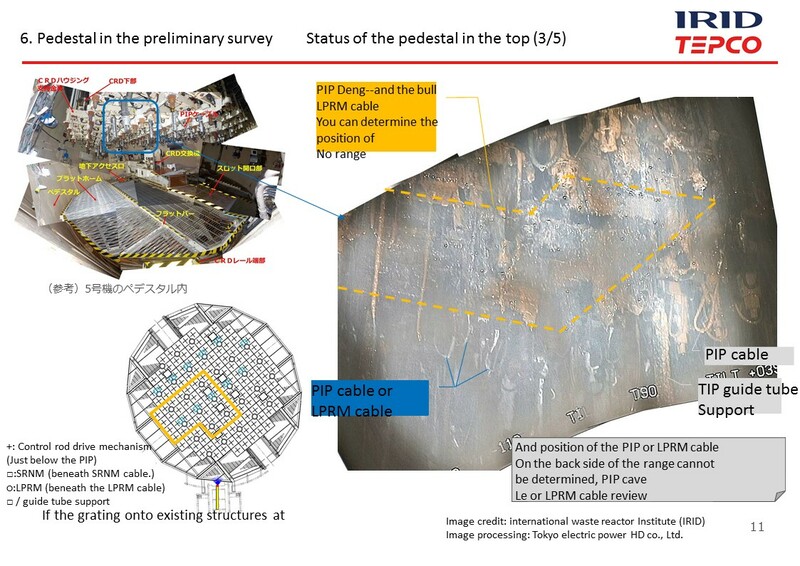 IRID has released additional details about the damage found inside unit 2 on the recent inspections of the containment structures. A number of abbreviations are used in the handout. These help identify what is being seen but they hold a limited bearing on the actual findings. These pieces of equipment are used in monitoring and operating the reactor. 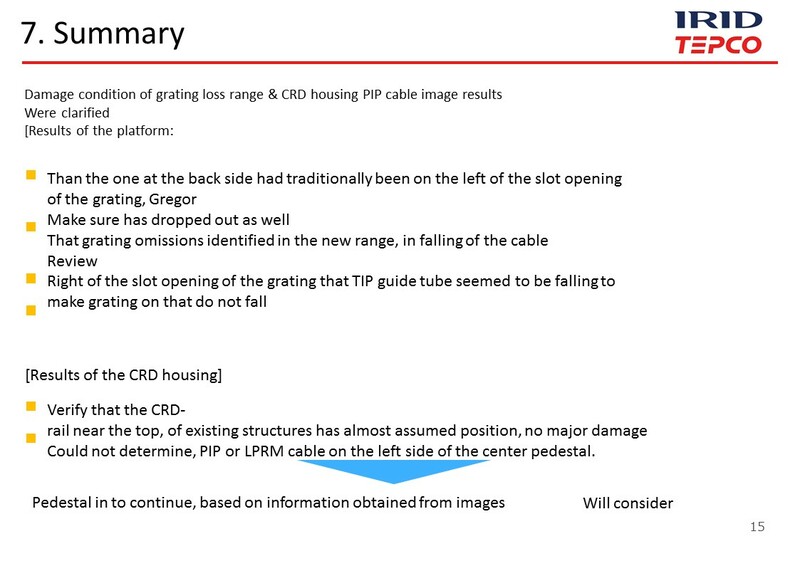 The slides from the IRID handout below are just the new slides that contained additional information. Each has been machine translated. 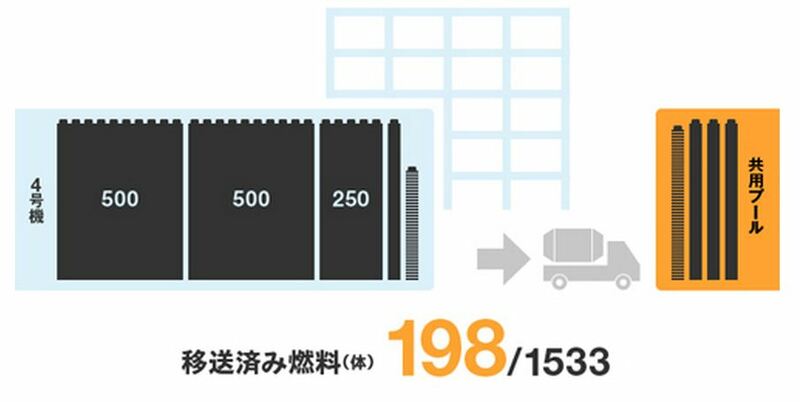 Please refer to the original handout in Japanese, linked at the beginning of the report as needed. 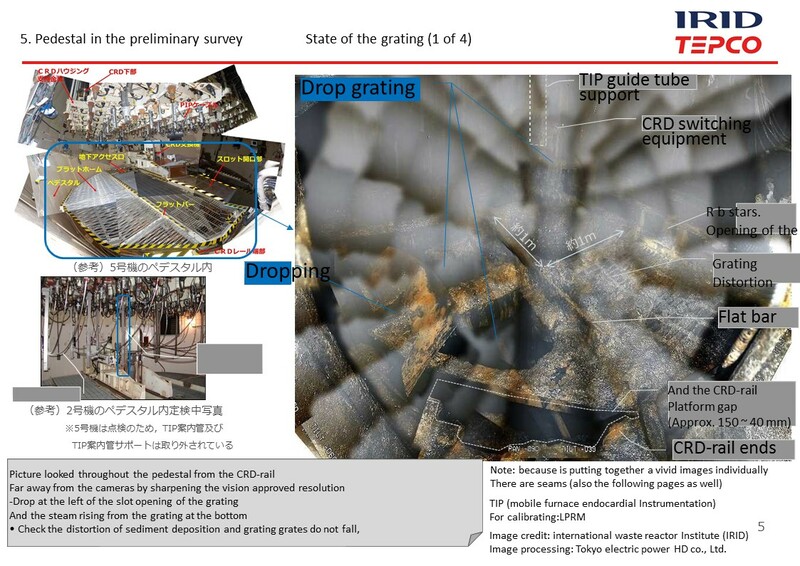 The first slide identifies the locations where the grate fell through and that the adjacent grating is distorted. They also confirm that steam is coming from this hole in the grate. 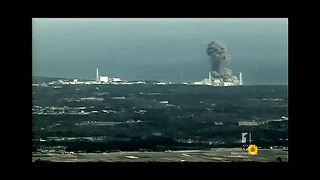 Early investigations in unit 2 found considerable amounts of steam in containment and coming from the reactor well on the upper refueling floor. This new inspection saw less over all steam in the containment structure but they were able to identify steam coming from the hole in the grate. A section more distant to the hole in the grate, they identified fallen pieces of black cabling. The far right distant grate did not show the kind of damage found on the closer left side. They did identify the ends of two TIPS probe tubes. 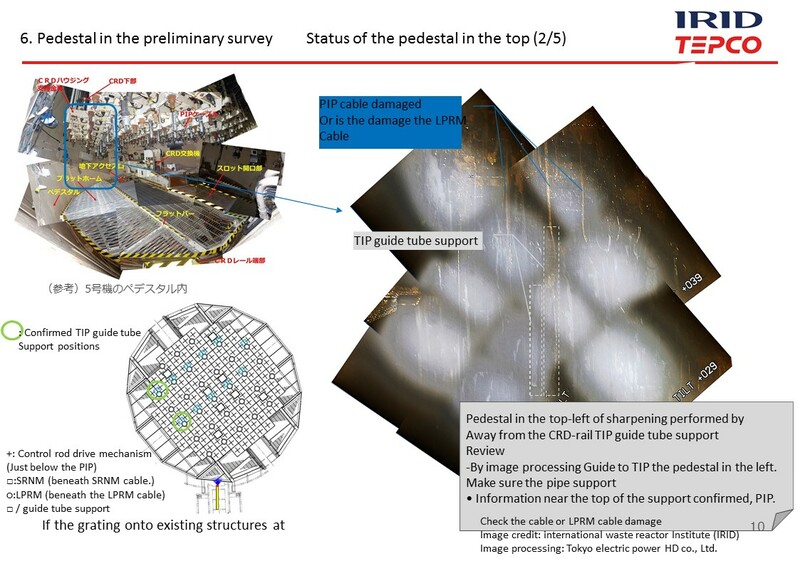 Earlier investigations of the TIPS system tried to run an inspection probe up one of the tubes. This found eventual blockage inside the tube that included a melted substance that included some metals. 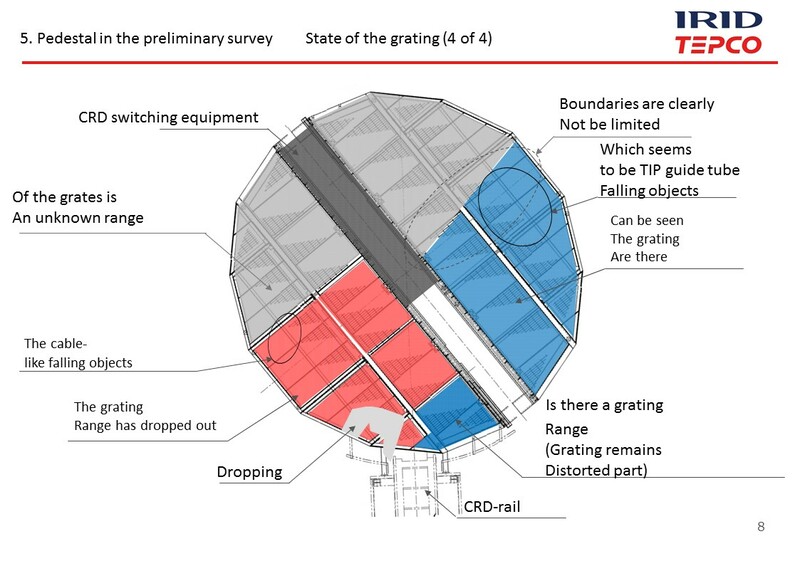 This diagram clearly confirms where the damaged grating and hole are located. This includes a section of missing grating near the entry to the pedestal area. 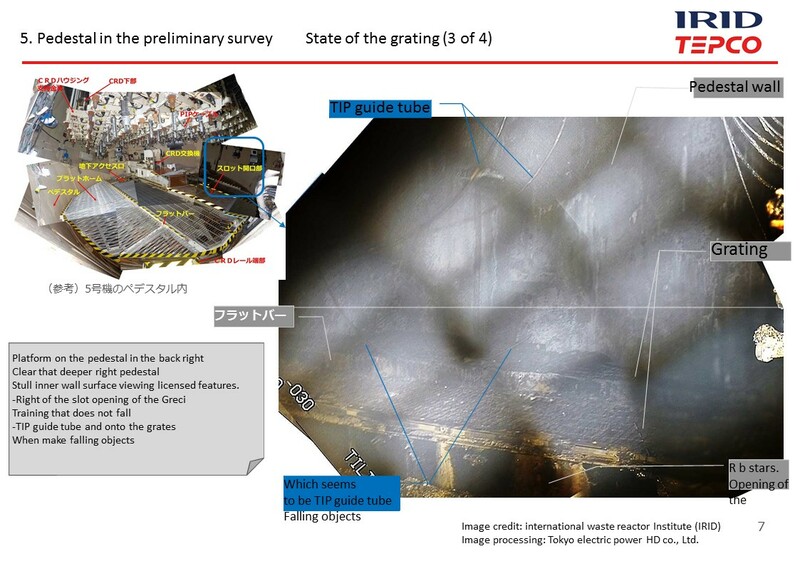 The upward looking image identifies a number of structures and also the absence of those structures in a section that roughly corresponds to an area above the hole in the floor grate. 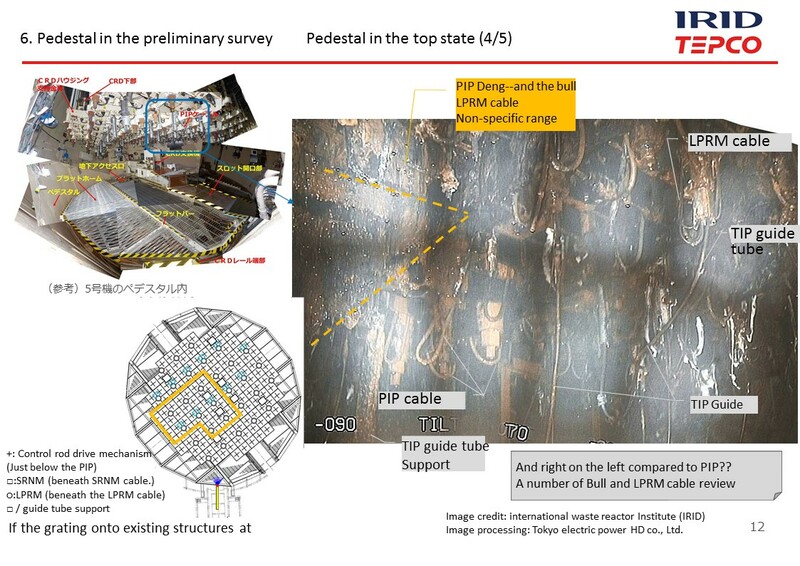 The further left section is able to identify some remaining TIP structures and also some damaged cables. 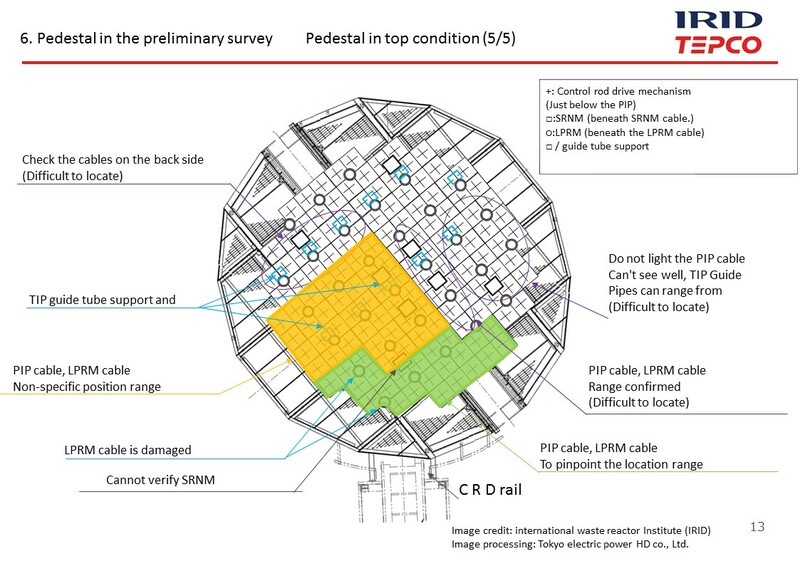 This photo and diagram confirm where the missing sections of the upper structures are and how they match the floor grate area. This is the likely location of a corium path and where the reactor vessel failed. This image shows a further right view. The yellow boxed section is clearly distinct compared to the intact sections to the right. 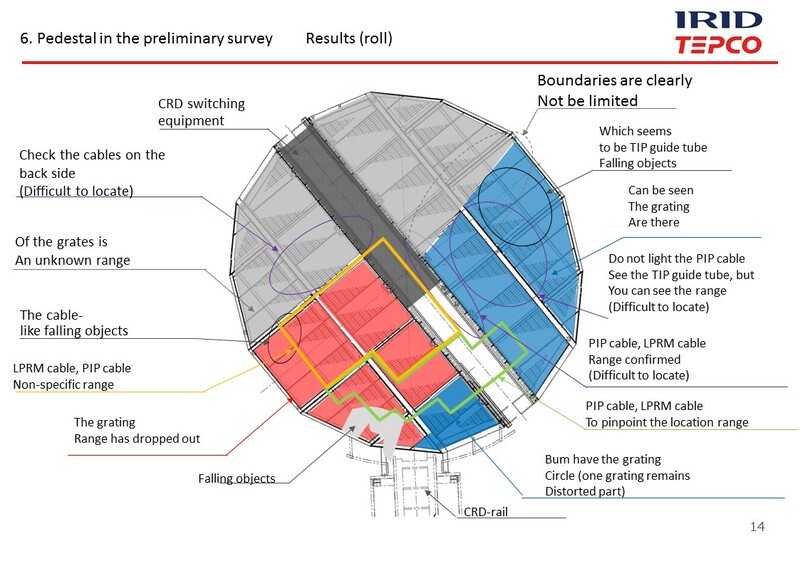 This diagram shows where they can identify structures, where structures are known to be missing and where they are unable to see to date. The diagram below identifies what is known about the floor grate. 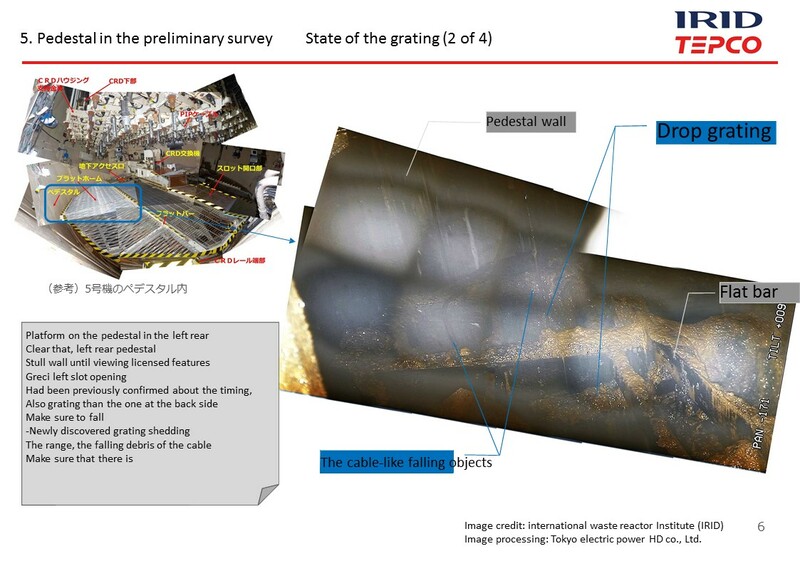 Where the grating is missing or damaged, where it is intact and what sections are yet to be identified. The summary considers the sections they can’t currently view and the potential to conduct further work in those areas. 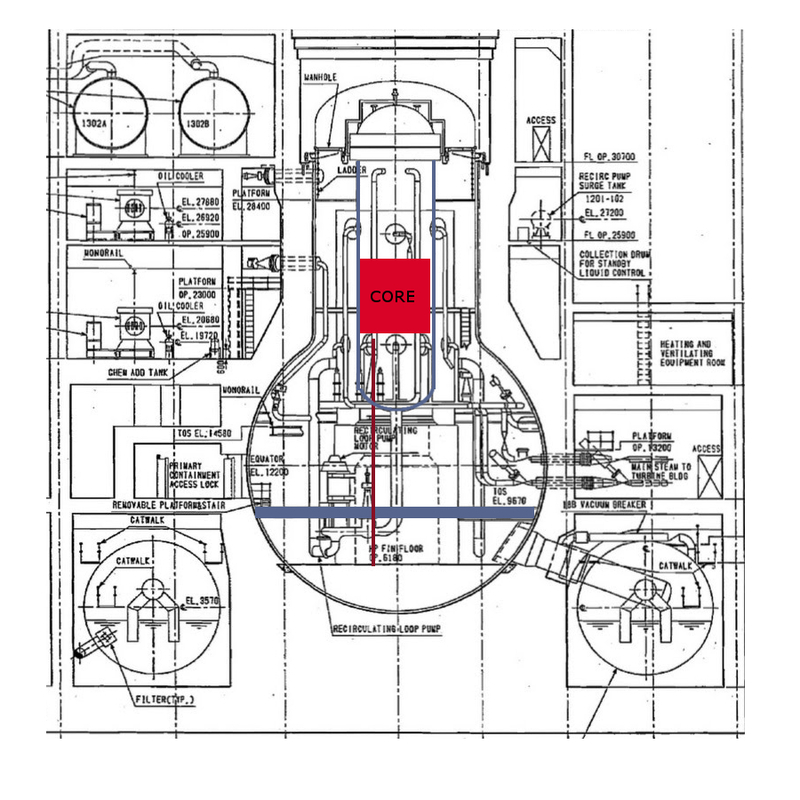 Our diagram below shows the rough location of the reactor vessel failure and melt through on an elevation drawing. 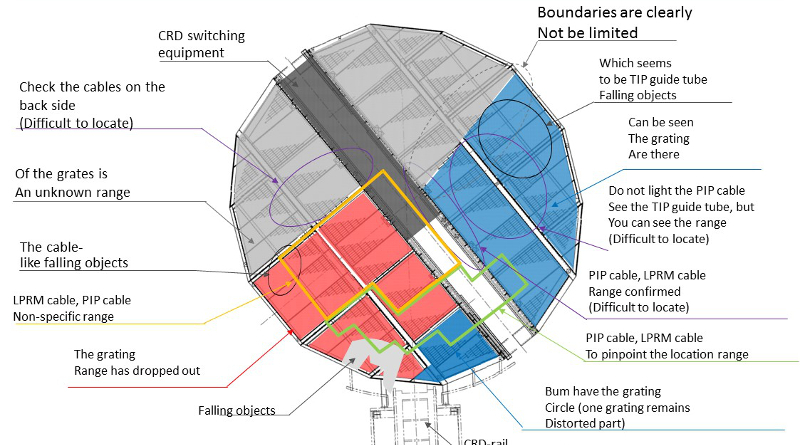 Having a reactor vessel fail to the side of the bottom head rather than directly in the middle is a phenomenon found in destructive modeling research. So this finding is not unusual. It would be useful to confirm if other sections of the pedestal include more melt through holes. 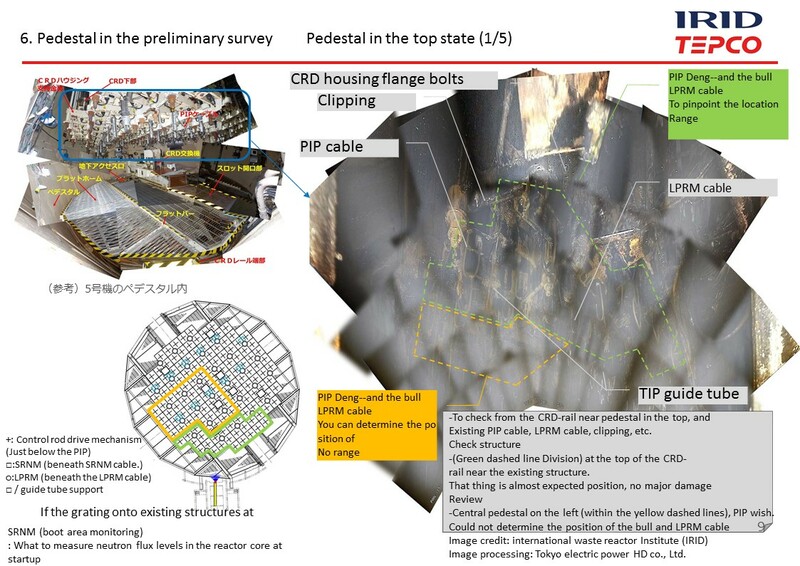 A limited rupture and melt through increases the probability that unit 2 may have burned down into the basemat concrete of the pedestal floor rather than flowing across the containment floor.